Eel isn’t for everyone, but if you like eel, you will love this! Dan takes just a few things and makes them into something that will leave you feeling gentEEL. • Place pot of salted water onto boil. • Peel 4 large russet potatoes and slice into 1-inch pieces, and add to gently boiling water. Let cook until completely tender, approximately 8 minutes. • Place frying pan onto medium-high heat. • Cut Eel into 6 inch pieces. 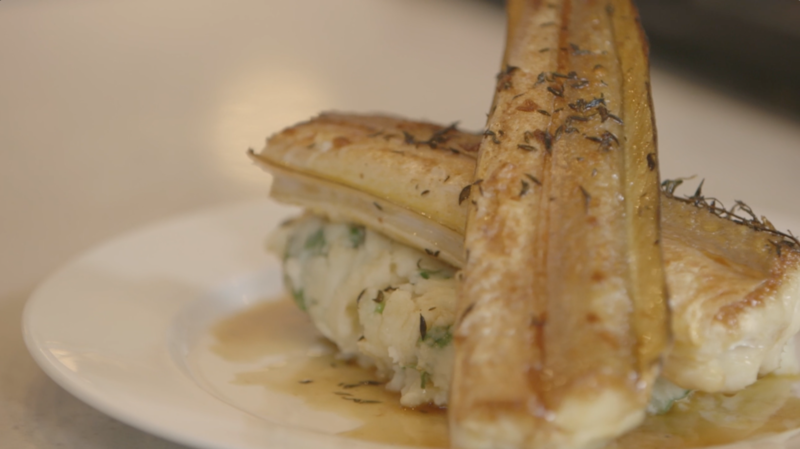 Score the Eel by slicing it lengthwise along the middle and along either side. Season with salt. Once pan is hot, add 2 tablespoons canola oil and add Eel. • As Eel fries, add small handful of thyme and 4 whole cloves garlic to the pan. Cook 5 minutes on medium-high and then into a 450 degree oven for 5 minutes. • To finish mash, drain water, add ¼ cup butter, 1 small bunch green onion sliced, and season with salt to taste. Mash. • To finish fish, remove from oven, add thumb-sized butter and shake pan to coat the fish. Remove fish onto plate, discard thyme and garlic, and squeeze juice of 1 lemon into pan and shake to combine butter, lemon and brown bits on bottom of pan. • Place mash on plate, top with fish and spoon the beurre noisette over fish.